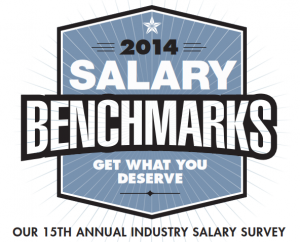 We are thrilled to be included for more than 10 years in Marketing Magazine’s annual Salary Benchmarks publication. On newsstands now, the article breaks down who’s making what in the marketing industry and why. 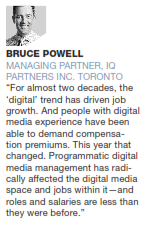 It includes data and salary ranges for 89 key positions, with first-hand accounts and data from 21 high-profile industry-specific recruitment professionals, including IQ PARTNERS‘ own Bruce Powell, Randy Quarin, Mark Rouse, and Maurizio Calconi. According to the article, “the result is a comprehensive snapshot of the modern marketing job landscape”. 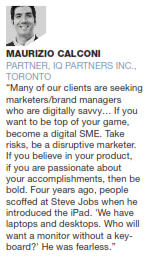 Read on for excerpts from the article highlighting trends in the marketing job landscape for 2014. To access the salary benchmark data for 89 key marketing positions across small, mid-sized, and large companies, pick up a copy of Marketing Magazine November/December 2014 and check out their website for more information.